Can you believe it, K'nex is 20 years old this year! They're celebrating their 20th anniversary all year, so check out their 20th anniversary page for news of new K'nex sets (including re-releases of their classic sets), contests and sweepstakes. 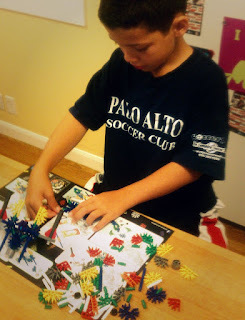 K'nex has been one of our family's all-time favorite toys; even before I started raving about K'nex online, we had already amassed a gigantic collection of K'nex pieces. 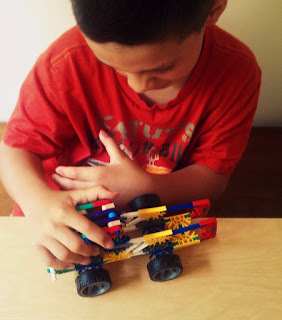 We began playing with K'nex about 4 years ago, when the boys were about 4 years old and I was looking for interlocking toys that didn't break apart so easily. K'nex fit the bill perfectly, and their unique system of rods and connectors meant that we could build much more sophisticated shapes and designs. 3Po and Jammy have been playing with K'nex half their life, and they enjoy it as much as they ever did! The K'nex Classics Rally Sport Racer. Both sets feature the classic chunky rods and connectors that K'nex first came out with in 1992. They are recommended for age 7+, but with a bit of adult guidance I think even a 5 year old could build it. The set includes instructions for building 3 different types of planes or race cars, so the building fun doesn't stop even after your child has built it once. He can always take it apart and build again! Of course, half the fun of K'nex is playing with it after you've built it up, so it doesn't look like Jammy will be starting on the second version for a while (although we have so many K'nex pieces already, he'll probably be able to make all 3 versions separately!). Fortunately, K'nex piece snap together so sturdily, the built-up model can withstand quite a lot of active play without breaking into itty-bitty pieces. These Classic K'nex sets are called classic for good reason -- boys have been enjoying them for the past 20 years, and they'll continue to do so for the next 20 years and beyond! Happy 20th, K'nex!